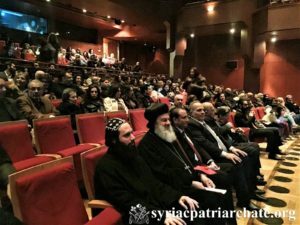 On March 20, 2019, His Holiness Patriarch Mor Ignatius Aphrem II attended the Festival of the Aramaic Language in the poems of George Rizkallah which was held at Dar El Assad Opera House in Damascus. His Holiness was accompanied by Very. Rev. Raban Joseph Bali, Patriarchal Secretary and Media Office Director, and Rev. Dayroyo Boutros Dakermanji. The festival included choirs who performed songs in Aramaic, especially from the town of Maaloula.